How are Illegal Immigrant Crimes Handled? The intersection of immigration and criminal law is one of the most complicated areas of law in the United States. Illegal immigrants who are charged with many types of criminal offenses can end up being deported to their country by the Department of Homeland Security and face other various penalties. Not only can these illegal immigrant crimes affect the lives of the immigrants charged, but in many cases, these offenses can also impact their families. 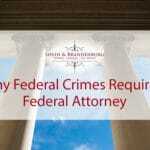 This article reviews some of the most common types of federal crimes with which illegal immigrants are often charged. Aggravated felonies refer to a group of crimes that carry harsh penalties for an illegal immigrant and other non-citizens. Conviction of an aggravated felony can lead to a number of different penalties including refusal to grant asylum and not being barred from admission into the United States at any time in the future. An offense is not required to be aggravated or a felony to constitute an aggravated felony for the purpose of federal immigration law. Instead, Congress classifies a much larger group of offenses as aggravated felonies. Today, an aggravated felony includes more than 30 types of offenses including failure to appear in court, simple battery, and theft. 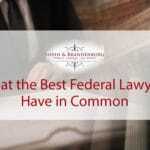 Even if a crime was not classified as an “aggravated felony” at the time that a person was convicted, an illegal immigrant can still end up facing this offense if Congress later adds the offense to the list of aggravated felonies. The wide category of moral turpitude includes many of the crimes that are also classified as aggravated felonies. Illegal immigrants and other foreign nationals who are convicted of crimes involving moral turpitude can end up facing many of the same penalties. These offenses involve acts that “gravely violate” the accepted standards of the community. Each state law covers a different group of behaviors that constitute moral turpitude. As a result, an offense can be classified as a crime involving moral turpitude in one state but not in another. A foreign national convicted of an aggravated felony can be classified as ineligible for asylum, which is a type of protection offered for immigrants who have a fear of persecution in their country or last country of residence. Illegal immigrants who are removed from the United States following a conviction for an aggravated felony and who later attempt to re-enter the country can end up facing enhanced penalties. An immigrant removed from the United States after being convicted of an aggravated felony can be found permanently ineligible from entering the country. Contact the Federal Criminal Law Center today to speak with an experienced immigration law attorney. We understand the numerous complex issues involved when immigrants are charged with federal crimes. Contact our law office today to schedule an initial free consultation. This entry was posted in Criminal Defense, Immigration Crimes and tagged Criminal Defense, Deportation, immigration law. Bookmark the permalink.